So I thought that I would post this because when I was searching online I found it hard to find resources on blend pots, but it is very helpful when you want more options on your guitar but don’t want a huge mess of switches. My apologies to whoever created the wiring diagram below, but I can’t remember where I found it. I think it may have been from Stewart MacDonald or another supplier’s website. This is a small diagram which depicts how to properly wire a blend pot. Soooo…..what is a blend pot? Source A and Source B are the pickup wires; where you see wires crossing in the center of the diagram it shows that the corner tabs are wired each to the opposite corner; then the output and ground get wired out as normal. And blammo! You have a blend pot properly installed. Hopefully this is helpful to you! And here is the obligatory eye candy that accompanies every post; this is a guitar I made (the J11 prototype) that has only three knobs – master volume, master tone, and a blend pot to fade between the two pickups. Very clean! No mess of switches and knobs. Cheers! Finished J11 prototype with master volume, master tone, and one blend pot as the controls. Made a duplicate of my crown-shaped headstock template so I wouldn’t ruin the plexiglass master template. Hard coming up with a headstock that nobody else has used but I think I succeeded with this one. Then trimmed it flush with the tempalte & router. Afterward I did the truss rod access hole using the dremel. This will have a TRC which goes up against the nut, probably white MOP from Andy DePaule. Also sanded the radius on the nut using the belt sander. And here she is! NExt is the custom cut pickguard, and then time to glue on the fretboard. I need to make the shim for under the fretboard as well (since it has an angled tenon and a flat top, the fretboard rises very slightly above the body – I’ll fill the gap with a shim made of darker wood like a scrap Ebony or Ziricote cutoff rather than a piece of rosewood). And here is the pickguard done. 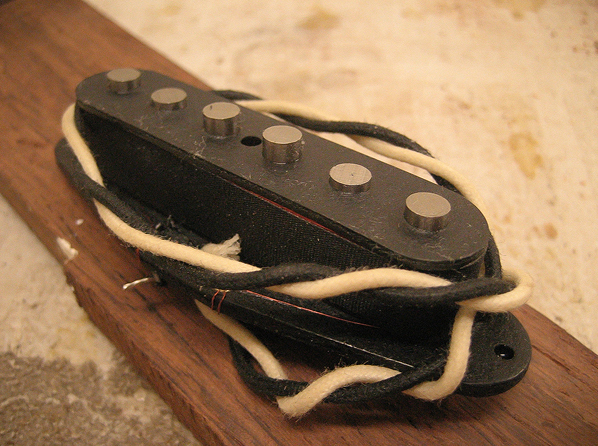 Routed the pickup cavities and chiseled the edges sharp so the elctronics would fit properly. This is the space under the fretboard created by the neck angle. Didn’t realize at the time (should have!) but the angle was a bit steep (even though here it’s angled more than the final product is, still steep). Anyways, the shim will be glued in to fill the space. Placed in the truss rod and glued on the fretboard. Carved the neck and made the nut. Here it is with the tuners holes drilled and tuners fit; the neck is not glued in at this point. Did all of the wiring. Fit the bridge and tailpiece bushings. Glued in the neck and rounded the edges of the body over. Routed the headstock and glued in the logo with epoxy dyed to match the rosewood headplate.